This 1980 card is probably not the last Mario Guerrero card ever produced, since he was officially a major leaguer until April 1981, when the Seattle Mariners released him, but it’s the last Mario Guerrero card I own. My card buying dropped off precipitously in 1981, a fact I rediscovered a couple weeks ago when I spent several of my limited hours here on earth sorting my entire collection into alphabetically ordered players within years within teams. Some teams had a couple cards from 1981, some had one, some had none. From the looks of it, I bought two or three packs of cards for the whole year, a buying rate that I often approached on a weekly basis in the preceding years. Suddenly what had for years been of central importance to me was no longer the least bit important. Maybe someday in the not too distant future I’ll talk at greater length about the neutron bomb of puberty, but for now I’m going to set aside any discussions on why I suddenly had no interest in baseball cards. Today the focus is on the baseball player whose major league career spanned almost exactly the fully conscious (i.e., aware of baseball) years of my childhood. When Mario Guerrero was released, so was my childhood. While I can’t verify this, I believe it’s very possible that April 1, 1981, the day the Mariners traded Mario Guerrero for the absence of Mario Guerrero, was the first warm day of spring in Central Vermont, and as such provided the opportunity for a certain bespectacled, increasingly awkward 8th grade soon-to-be former collector of baseball cards to notice for the first time that all the girls in his grade had suddenly grown breasts. So this card is really the last hurrah for better or worse of a breastless world. It’s possible that this may be why I find some aspects of the card a little strange. For example, Mario Guerrero doesn’t really look like Mario Guerrero. Besides being bearded, he also appears to have a puffier face, lighter skin, less distinct features, and cloudier eyes than the dark, rugged-featured man beaming with eagle-vision from the earlier Mario Guerrero cards. If not for the matching statistics on the back, I might have thought that another Mario Guerrero had infiltrated the league. Another discordant note sounded by the card is in the fact that Mario Guerrero is on the A’s. I had always resisted evidence contrary to the idea that he was still and forever a member of the Red Sox, but somehow his previous appearances on the Cardinals and especially the Angels (where Red Sox players were constantly ending up or coming from) were not as injurious to this fantasy as seeing him clad in the bright white shoes and seasick green and yellow piping of the A’s. 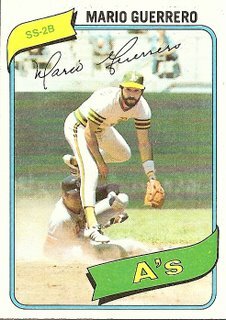 Possibly a part of the unease at seeing Mario Guerrero as an A derived from the perception of that franchise that I got from the collecting of baseball cards throughout the latter half of the 1970s, a period of dismal decline for the A’s, as pointed out recently in a comment by Pete Millerman. I regained this perspective on the A’s recently while sorting my A’s cards into years. In 1975, many of the players were still around that had formed, in terms of consecutive World Series titles, the greatest non-Yankee dynasty ever. Rudi, Jackson, Hunter, Bando, Blue. Even in 1976, there are still vestiges of the dynasty in my collection. Fingers, Holtzman, Campaneris. By 1977 Bill North was the only one left, and in 1978 and 1979 the last place A’s were a wasteland of Jim Tyrones and Jerry Tabbs. The 1980 set of A’s seems, in retrospect, split between members of the scrapheap A’s and members of the young Billy Martin-led A’s squad that would end up playing exciting, winning baseball throughout 1980 and 1981. If I sensed this split at the time between the promising young players, such as Tony Armas, Mike Norris, and Rickey Henderson, and the has-beens and never-weres, such as Dave Chalk, Craig Minetto, and Larry Murray, I would have had no choice but to rank the aging reserve Mario Guerrero, with his 5 career home runs and his 39 career sacrifice bunts, among the latter. In other words, the once-proud A’s were about to make the climb back toward respectability, and Mario Guerrero would only be symbolic of the swamp of mediocrity they were climbing up out of. With all that said, let us now praise Mario Guerrero. In his eight-year career he belonged to seven major league franchises, three of whom he never played for while the rest never seemed to care much whether he played for them or not. He was, due to circumstances beyond his control, a major league drifter, and as such could have been forgiven for allowing a drifting, degenerative quality into his professional habits. This appears not to be the case, however. He was consistent, and by most accounts a reliable fielder at second and short, and, at least as utility infielders go, not a terrible hitter either. He did his job as best he could. I know this because of all my Mario Guerrero baseball cards, especially this one. In this 1980 card, even though he does not even look like himself anymore, Mario Guerrero shows perfect form in completing what may be the most difficult common play in baseball, the double-play relay. The runner has barreled into him, trying to break his concentration, but it seems even death personified could not jar the focus of this unflappable journeyman. And here comes Mario Guerrero’s throw, straight as an arrow, right on target. Right at anybody with eyes to see. You are currently browsing the archives for the Mario Guerrero (Oak.) category.